After laying over in Mexico City, eleven students from the University of California, Santa Cruz (UCSC) landed in Cancún during the last week of March 2010. They traveled down to the Yucatán Peninsula to participate in the Community Agroecolgoy Network’s (CAN) first alternative spring break (ASB) trip. CAN is a non-profit organization associated with UCSC’s environmental studies department, which works to promote sustainable agriculture, communities, and trade in Central America. The trip was lead by Devon Sampson and Grace Voohris from UCSC in conjunction with Professor Juan Jimenez, Alfonso Castillo, Hector Estrada, Juan Antonio Jimenez, students from the Universidad Autónoma de Yucatán (UADY), and the community of Tzucacab. The primary goal of the project was to design and start a 1-hectare school garden at La Escuela Secundaria Tecnica Numero 65, which is a junior high school in Tzucacab that teaches technical trades, such as computers, animal husbandry, and agriculture. One might ask, why is it necessary to create an educational garden in a community that already revolves mainly around agriculture? This was one of the questions facing participants prior to the trip. Yet, as our group learned more about agrobiodiversity, immigration, and farming methods being tested in the vicinity, an answer began to emerge. Currently the technical school teaches conventional farming methods and as interest in agriculture and knowledge of local crop species decline within newer generations of students, the conservation of local farming methods and crops becomes important to sustaining agricultural land and livelihoods in the region. More than just a project for the school, the community was looking for a pragmatic use of local biodiversity. Throughout the week the ASB group stayed with their host families as they worked on the garden in the mornings. The afternoons included field trips to nearby farms and sites of cultural interest. As you scroll down you’ll learn more about the week’s activities as well as see and hear the stories collected on this program. Prior to any work on the garden, the first full day in Tzucacab was spent at the school participating in the Hetz lu’um Ceremony. It’s a traditional Mayan ritual to bless the land. Lead by the H’men, a shaman, the Hetz lu’um is done to cure the homegarden and feed the land (Barrera-Bassolos and Toledo 2005). During the daylong preparation and ceremony, community members, students, UADY students, and the CAN group worked together to prepare the meal, which was a stew-like dish. The women prepared the vegetables and the chicken as the men worked on digging and maintaining a hot pit in the dirt to bake the corn dough wrapped in leaves. The main course that everyone prepared for throughout the day was finished and ready to eat around 4pm. It was a hardy meal containing a mix of all the chicken parts, spices, vegetables, and baked corn. Read more about the preparation of the meal told by a teacher here. Soil maps were created beforehand under the guidance of Hector Estrada to help us design the layout of the garden and to select the appropriate plant species based on their soil requirements. The design was a collaborative effort based on the school and community’s needs mixed with the research and knowledge of the community members, UADY/UCSC professors, and students. During our first work meeting, students, teachers, and community members brainstormed designs for the garden. With the provision of a soil map and information about the needs of different species of plants, we broke off into smaller work groups to sketch out our ideas for the garden. At the end of the night each work group presented their concepts. The next morning a representative from each group gathered together to draw the final design. Work began around 7:30 am till 11am each day. On the first day of work we started by clearing out the garbage and the lingering foliage on the land. For the rest of the week work involved clearing weeds, creating a compost heap, removing stumps and roots, relocating rocks on the land, and learning to create garden beds from the students at the school. By the last few days we began planting plants such as chaya (medicinal plant) and ciruela (plum tree). 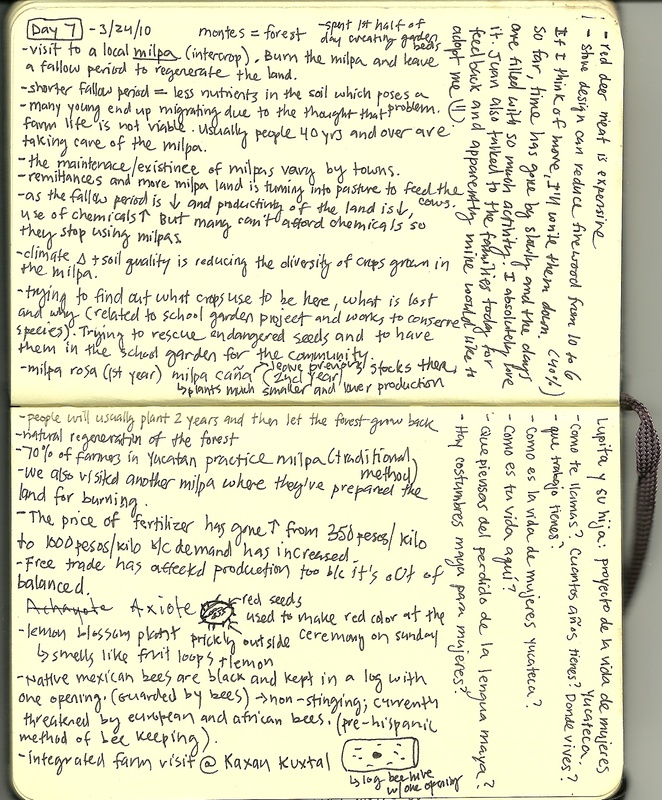 Field notes about milpa production. A milpa is traditional crop system in the Yucatán, which often consists of the intercropping of corn, beans, and squash. After lunch we re-gathered around 2pm at the plaza to go on a field trip to nearby farms and communities where we learned more about agricultural issues as well as practices to address the degradation of land. Visits included Tanta Kin, which is an agricultural research site. At Tanta Kin we learned about their vermiculture, native deer and pig production, and silvaculture practices. Our tour guilde told us that a reason for their research in different growing techniques is because current methods of pasture management in the Yucatán are not sustainable. We also visited a smaller scaled integrated farm in Ek Balam where we learned about native bees, aquaculture, and their agroecology practices. Other afternoons were spent shadowing the UADY university students as they conducted biodiverstiy surveys of local homegardens, talking to three local men about the issues surrounding immigration away from Tzucacab, learning about milpa production in the Yucatán, and watching a presentation on traditional Mayan houses. One of the most memorable experiences from the trip was through the homestay program. Each student filled out a questionare prior to the trip and was paired with a family in Tzucacab. Our homestays ranged from traditional Mayan huts to concrete homes. The families were hospitable and shared meals and aspects of their daily life with us. In the day time, vendors around the main plaza sell fruits and shaved ice while bicycle taxies await customers. At night we hung out at the plaza eating tacos, panuchos, churros, french fries and smoothies. There is a sweet woman who sells hot dogs with grilled onions from her cart. If we wanted to connect to the world outside of the town, the internet cafes provided a place for us to send e-mails and read the news. On the last night, the host families threw us a surprise party at one of the families’ home where we enjoyed an arrangement of food and dance till the late evening. We said out last goodbyes around 9am on day ten and drove to the Mayan ruins of Uxmal on our way home through Mérida and Cancún. (Top: Surprise party thrown by the host families for everyone on the last night. Photo by Emily Fuentes. For the full transcription and photographs click here. On an evening after a workday, we have a discussion with three local men about why young campesinos are leaving to work in other cities. The three of them have had experience working in the campo and the milpas for most of their lives and two have had sons and daughters that moved to areas, such as Cancún. Immigration really started when the tourist zone started – Cancún and Playa del Carmen. That was about 30 years ago. When they started to take off that is when people started leaving the town. Once they’ve experienced the bigger towns and the lifestyle in the tourist zone, where there are parties and drugs, it is sometimes hard to reorient them. There’s other things affecting this too. Climate change is another reason that the milpa isn’t producing very well. The production is very low. It use to be that it didn’t produce quite enough for the family, but now it’s even worse. He says the only reason that people still have a milpa is that they’re getting a subsidy called Pro-Campo from the government for each hectare of milpa that they do. This is a recording from the first half of the discussion, which included stories ranging from growing up in a time where they could harvest a diverse range of food for consumption to further conversation on climate change, NAFTA, chemical inputs, and government policies that led to lower production and profitability of traditional ways of subsistence. Devon Sampson helps to translate to us. The iipils are a very beautiful article of clothing that create a lot of attention. Above all they are expensive and difficult to make, because it’s very tiring to make one. What tires you is your eyes, your brain, and the head. A lot of time is spent hunched over to make the small crosses on a piece of fabric, counting each small square and each stitch that is going to form a flower or form a small bird or forming whatever form you want to make and this is tiring for the person to make. But one makes it. Why? Because it’s part of the clothing that are used by those in the Yucatán. The iipils are worn during important occasions and events. This is when the iipil is worn instead of day-to-day clothing. But now iipils are not worn as often, because they are very expensive. We are sitting outside with the florescent light of the overhang above casting a dim light on us. Lupe’s sister, the children, her father, her mother, and I are sitting together as the evening grows later. The dogs are barking and cars drive by. I ask Lupe questions in Spanish about her mother’s daily life in their town of Tzucacb, Yucatán and the changes she’s seen regarding Mayan culture. This is the recording between Lupe and her mother as Lupe helps me translate my questions to her mother. My name is Amada. I’m 65 years old. I was born in Tzucacab. Tzucacab is Ka Ka’lum [in Maya]. Why is there a loss of Mayan language? The people who don’t speak Mayan are arrogant about it. They’re proud. Those are the ones that don’t speak Mayan. 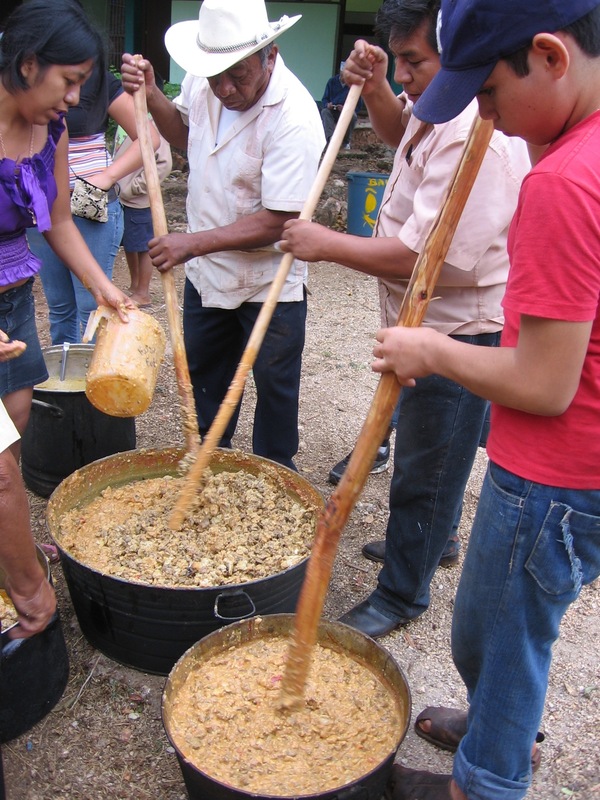 What’s your daily life like here in the Yucatán? I have an active life. When I wake up I work in the house, washing dishes, cooking, washing clothes. After I go to the Legion de Maria in the church where I give my services, such as visiting the sick, and I continue my day like this. Later I return home and finish what I can do and this is my life everyday. What are the changes in Mayan culture that you have seen since you were born until the present? I have seen many changes since the schools opened. The people stopped speaking Mayan and only Spanish. Losing little by little, because now nobody wants to speak Mayan, because everyone thinks it’s a langague that nobody likes. Since I was born till now, I’ve seen many changes, because of the opening of schools, the studies, and we’re losing Mayan culture and language or people are losing it because they speak Spanish instead. What year did the schools begin to emerge? Since I was born the schools existed, but before the poor people never attended school. The poor people never studied. Only the rich people. The poor only dedicated their time to work and they are the ones that speak the Mayan language. The change that happened is those that studied lost the Mayan language. I only spent my time working, working, and working and never studied. I don’t know how to read or write and I only learned a little to help me, because I am a housewife. Do you have any wishes for the future of Mayan culture? They should rescue the Mayan language, because it’s our race, our language. Above all it’s so good that there are people working to preserve it and more people teaching our children to continue the language, because it’s part of the Yucatán. Meet Fernando. Age 63. He was one of the community members interviewed by UADY students as a survey of biodiversity in home gardens. Fernando has 45-50 different species of plants on his property. The surveys have found that young residents usually have 3-4 species while the older community members tend to have 30-50 varieties of plants. Fernando told us he raises food primarily for personal consumption. One reason why he keeps his garden is to retain the knowledge from traditional home gardens that his ancestors have done. He shows us examples of different edible plants and seeds along with some of their medicinal benefits. This is a sample from part of the survey process with Fernando that was conducted by Eric (a student at UADY) and Javier (a student from UCSC). The questionnaire covered topics such as soil type, varieties of species, personal consumption versus vending, and types of garden systems. For the full transcription, diagram, and photographs click here. On our afternoon trip to Rancho Juvenile, which is owned by the local university, we learned about Mayan houses and the efforts to retain knowledge of their traditional construction. Santos tells us the story of what happened here in Juvenile and how they built these houses. When the university first acquired the land, the departments got together to figure out what they were going to do with it. They eventually decided to build Mayan houses, because they fit the landscape, give the feeling of being outside the city, and are traditional. In Mayan culture, the house is like a living person. What we’re trying to revalue is the architecture, the construction, and all the cultural elements. We have evidence of Mayan houses being built exactly like this as early as 1,100 years B.C. But there’s a way of thinking now that the Mayan house is in danger in disappearing because of all the globalization, all the new ideas, and the new materials that are available. There’s also a way of thinking that a house like this carries a meaning of poverty. That it means the people who live in them are poor. Maybe the people in the house, in economic terms, are poor, however, thanks to the Mayan house and the people who live in it, that’s why there’s still a Mayan culture. Under the Mayan house they cook traditional foods. Under the Mayan house they speak the Mayan language. Under the Mayan house they do the Hetz lu’um ceremony. The social relations inside a Mayan house are old ones. Maybe we can talk about the Mayan house as a symbol of poverty in economic terms, but not in cultural terms. Those of us who have a Mayan house are rich in culture. It is on our last night in Tzucacab. I arrived at my host mother’s house to talk to her mother about life in the Yucatán and Mayan culture. Her father, Carlos, sings for us in Maya and Spanish as I ask him to teach me Mayan words. My name is Carlos. I’m 65 years old. I was born here in Tzucacb. The song that I’m going to sing is called Linda Maria. The second set of songs is called Díos Mi Salvador. They are religious songs – first in Maya then in Spanish. Michelangelo, a student at the school, played us the theme song to Titanic on the recorder during the last day as we said our goodbyes in the classrooms. I pulled him aside afterwards and asked if he would play me a song. This is what he performed. It’s called Maria del Socorro. Amada teaches us some Mayan words and phrases and Lupe translates them to Spanish. The following are a list of words that she shares in order of her recording. The Mayan words with an astrix (*) at the end are spelt phonetically while the rest are translated from Gary Bevington’s book and an online Mayan-English dictionary. Ba’ax k’aaba’? : como te llamas? – what is your name? Good places to stay: Hotel Quetzal, Orquideas N˚10, Cancún (+52998883982) – complimentary breakfast and dinner. Bring a lock if you’d like to store your personal belongings in a locker. Transportation: Cancún Airport to Cancún – Take the ADO Bus from Cancún Airport to the final bus terminal in Cancún. Cost: $42 pesos. “A Basic English-Yucatec Mayan Dictionary.” www.mostlymaya.com. Last updated 20 January 2011. Barrera-Bassolos, Narciso and Victor M. Toledo. 2005. Ethnoecology of the Yucateca Maya: Symbolism, Knowledge and Management of Natural Resources. Journal of Latin American Geography 4(1): 9-39. Bevington, Gary. Maya for Travelers and Students: A Guide to Language and Culture in Yucatán. Austin: The University of Texas Press, 199. 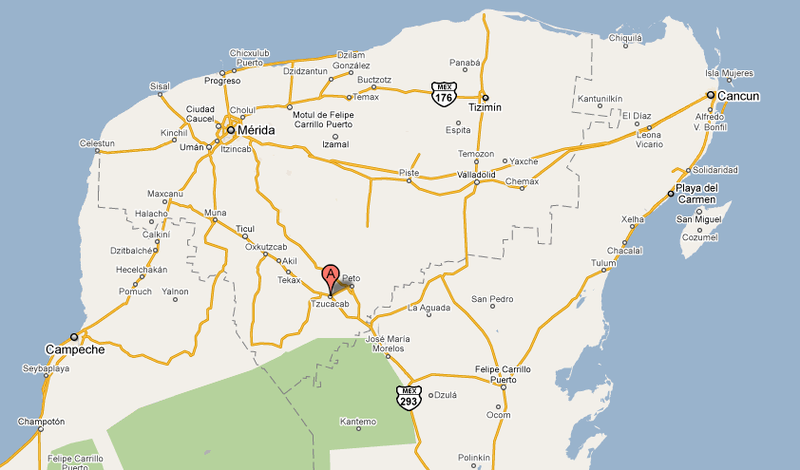 Map of Tzucacab from Google Maps. “At Home in the Sea” By Javelin. Album: Jamz n Jemz. Released: 2008. “Buffalo” By Davy Graham. Album: The Guitar Player, Released: 1963. “Adiós Pueblo de Ayacucho” By Raul Garcia. Album: Guitarra Peruana, Released: 1984. “Andean Ocean” By Javelin. Tape: Side B. Field Recordings: Michelangelo on recorder, clearing of land, and Hetz Lu’um ceremony. Thank you to Devon Sampson for helping in the research and transcription process. Grace Voohris, Chris Krohn, Alfonso, and Juan Gutiérrez for guiding us through our trip. Much thanks to the participants and friends on the trip Emily Fuentes, Michelle Hall, John Thorburn, DeAna Von Halle, Aliesha Balde, Javier Espinoza, Elliott Abbate, Matt Surryhne, Ashley McConnell, and Cory Barton for the memories and for sharing your host family photographs. All the host families and students that welcomed us into their homes and community. Lastly, thank you to Guadalupe and her family for hosting me and letting me record and photograph their stories. – Community Agroecology Mission Statement // To learn more visit their website @ www.canunite.org.